Devon County Council (DCC) has reinforced its commitment to do all it can to assist former and current members of the armed forces, by pledging its support as an employer. The council is already an equal opportunities employer, which means that it treats every applicant on merit – irrespective of background. Many of the Council’s staff serve or have served in the armed forces. A lack of familiarity about civilian services, and in some cases stigma, can make it difficult for many veterans and their families to access health care, to find suitable housing, get a job or join social groups. 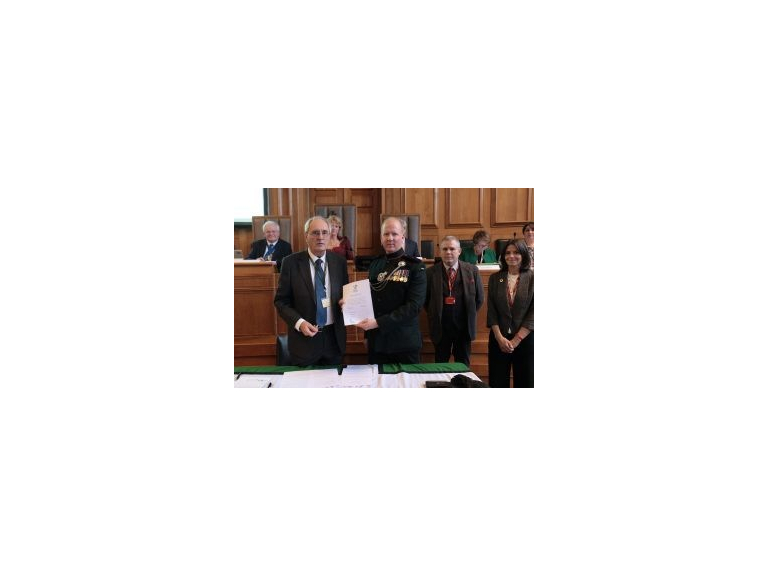 To help dispel this and to affirm DCC’s commitment to treating all applicants fairly, Councillor John Hart the Leader of the Council and Lt Col Jon Penhale of 6 Rifles Army Reserve, signed Devon County Council’s Employer Armed Forces Covenant at the Full Council meeting earlier this month. Over the last few years Devon County Council has help launch The Devon Forces Family website so veterans can access information on subjects including housing, support for military families, employment and health. Earlier this year DCC hosted the Devon Armed Forces Community Wellbeing Partnership Conference. Representatives from the partnership took the chance to network and discuss the challenges, the recent projects and how to build on the existing work to support the armed forces community. Member for the Armed Forces Covenant, said: “We have a duty to ensure that that those who serve or have served, and their families, are treated fairly. “The Council recognises the huge commitment and contribution that the Armed Forces community has made to Devon as well as to the Council itself.